Goji berries are one of the “superfoods” you hear about these days: lots of vitamins and antioxidents. They make a great addition to any smoothie, or can be eaten straight from the bush. Originally from China, Goji berries are becoming increasing popular in North America. Who knew we could grow them right here in zone 3? I bought this plant last fall and didn’t have a place to put it, so with much trepidation I buried it in a warm spot next to my house for the winter. It gets down to -30C here on a regular basis during the winter months, so I wasn’t certain it would survive. Not only did it survive, it prospered. 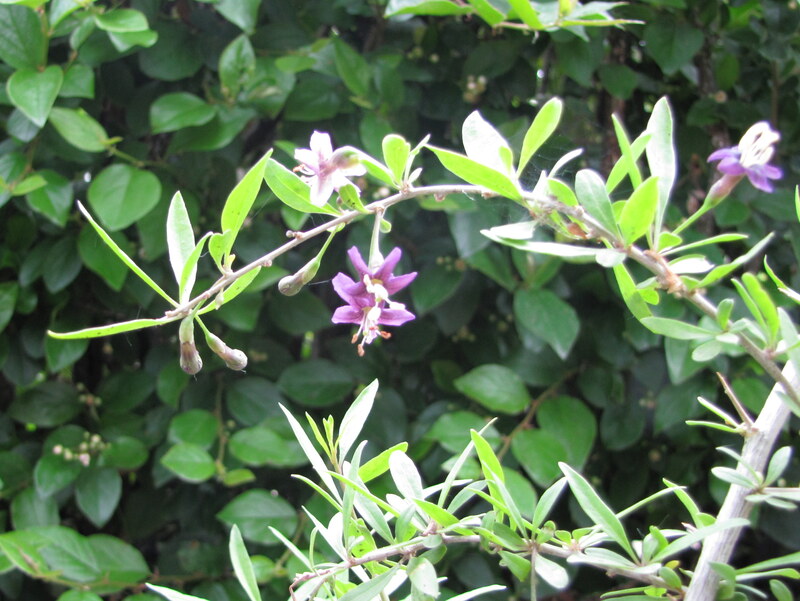 Now in it’s new home in my front yard, my Goji bush has several blossoms and lots of new growth. I can’t wait for that first smoothie. Did your plant set fruit at all yet? I’m sorry, I can’t bring a scent to mind. I’ve had the gogi for one season and it did flower and set fruit. The flowers were a lovely mauve color. One garden grrl deserves another!